I thought that I would be back home in Illinois today, but we will be staying 2 more days in Florida because of the bad weather in the East. Not what we expected for the end of our vacation, but not a bad place to be stranded. Today I thought I would share an organizational tip with you. I am big on organization and neatness, to the occasional dismay of my family. It has never been a problem for me, but apparently it can get on their nerves at times. 😉 I don’t think I’m OCD about it, like putting things in alphabetical order or color order, but I do like things put away and in their proper place. Anyway, since we have a very small entry and there’s a lot of going in and out during the day with the dog, in snowy, cold and wet weather, we needed to have some kind of organization to have everything we need in this small space. Our coats, hats, gloves, boots, shoes, umbrellas, dog towels, leashes, bags for dog walking and dog coat need to all share this space. I used to have an attached garage, so I had space where we could keep our wet, dirty shoes and we could dry Finn off without making a mess in the house. We don’t wear our shoes in our house, so when we come inside, all of our outdoor gear stays by the front door. My goal was to have everything we need to go out by the door but to have a nicely decorated and stylish space. To make the most of our small entryway, the first thing I started with was a long bench that has a shelf under the seat. 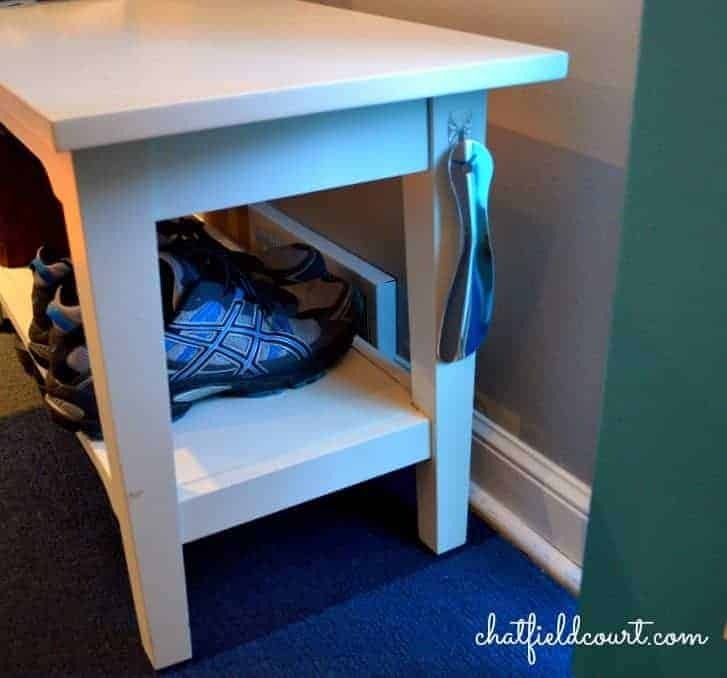 We use the shelf and the space under the shelf to house our shoes we wear every day, and of course, the seat is handy for putting on your boots. 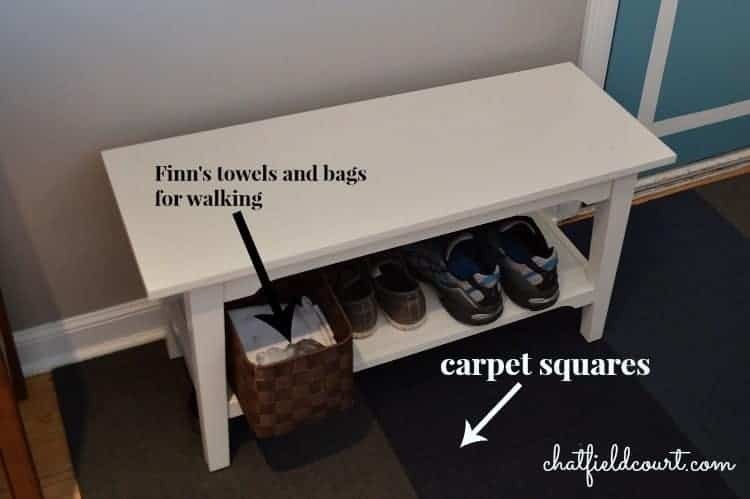 I also have a small basket, that I bought at Target, that I keep towels and dog walking bags for Finn and I used a Command hook to hang a shoe horn within easy reach. I also chose to use FLOR carpet squares here (I have no affiliation with them) They have worked out great. If one of them gets muddy all we need to do is to pick up that square and rinse it under the faucet, let it dry and it’s good as new. You can mix and match colors and make whatever design you choose. Love them. Next we have the coat rack that I made. This is for our every day coats, Finn’s leash and collar, and our keys. We do have a rather large coat closet, large for this small house, that has some really nice built-in shelves, so all of my shoes and my husband’s shoes live in here, along with our coats. I have a small shoe rack for the shoes that I wear occasionally and we hung a wire basket on the wall of the closet for our hats and gloves in the winter (this keeps the coat rack from getting piled up with winter clothes). If we don’t need it, I can just flip it up and hook it to a cup hook to keep it out-of-the-way. I also hung a Command hook on the inside of the door to hold my umbrella and extra dog leash. We have had one wicked winter and we needed a place to put all of our wet boots when we come in. This was a challenge because there isn’t much room, but I bought a boot tray with a liner from Crate and Barrel and ended up putting it next to the rug. It keeps the rug from getting soaked and muddy from our ever wet shoes. Not ideal but it’s ok for us, since it’s just the two of us. When the girls came home for Christmas, we didn’t have anyone tripping over it, which is what I was concerned about. For some style I painted the inside of my door with BM Blue Lake and dressed it up with some “faux” trim. I also hung my deer head that I got at Home Goods last year. That’s my small entryway. Not much space, but we’ve made it work for us. Do you have a small entry? Any tips you could give about storage in your small space? Where did you find the long bench that has a shelf under the seat at? That is exactly what I need in my house. I have a small entry way and need something with storage underneath but not bulky and what is in that picture is perfect. Hi Kelli. I got the bench at LLBean here. I did end up painting it black and upholstering it though but it is the perfect size for my small entryway. Hope this helps. Hey! Love the entry. Where did you get the small bench? Hi Jessica. I got the bench from LLbean, here . Thanks for visiting! It’s beautiful! We have no mud room and a tiny coat closet….. With 5 of us here plus 6 kids that I also watch (thankfully not all at the same time) our entry can be a disaster. I built my own “locker” system to deal with it, I’m hoping to finish the post and share it soon! I love your blue door so much! Thanks Emily. Wow, I guess your entryway is really, really busy but it sounds like you have come up with a great solution. Can’t wait to read your post. Thanks for visiting. So nicely organized! Our entry way is a wreck – boots and shoes and coats, OH MY! 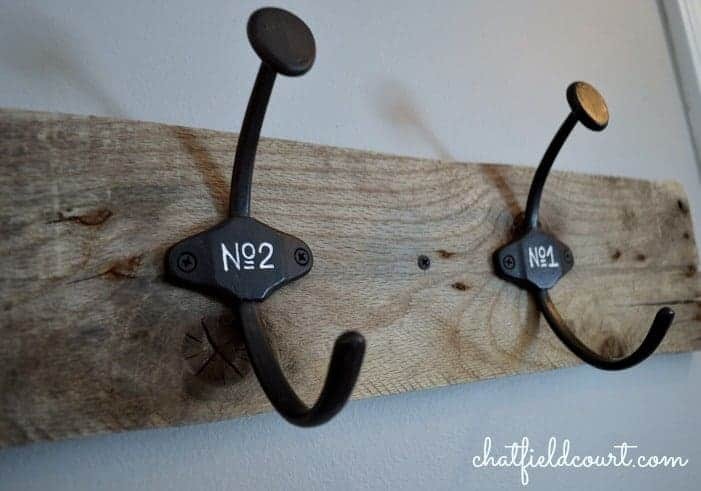 I took down the hanger rod from the closet and put in hooks thinking that it would be easier for everyone to hang up their coats – HA! My kids love jackets of all kinds and even though my daughter has her own place, we STILL have way too many coats (and that is after we purged and gave a bundle to the homeless shelter). By the way, I found you via Cozy Little House’s welcome wagon. Your blog is lovely! Come by and visit me at Home In Douglas! Thanks Paula. It is so hard to keep an entryway organized isn’t it? It’s one of the busiest spaces in the house, especially if you have cold and snowy winters. I appreciate you visiting from Cozy Little House. On my way to visit you at Home in Douglas. 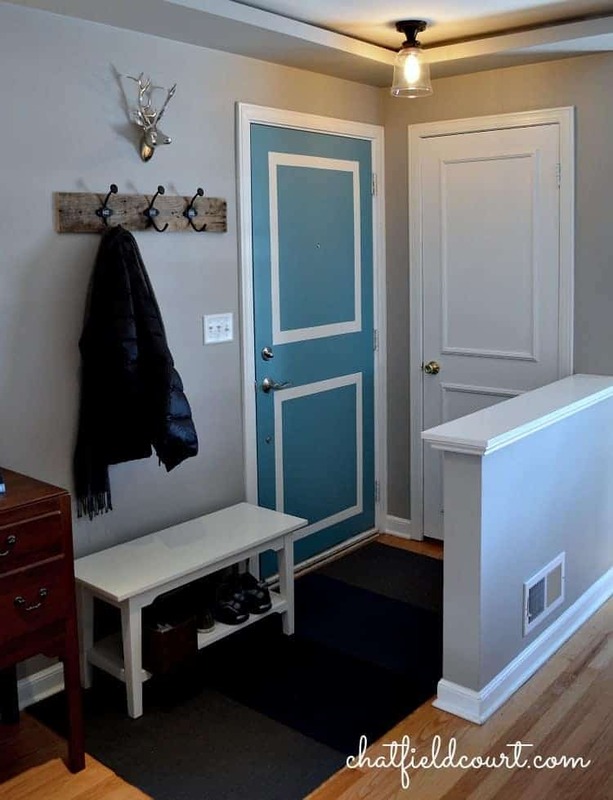 Love your coat rack and your painted door! That color is one of my favorites!! Thanks Cindy! I love it too. I, too have a small home and my entryway is from our attached garage into my dining room. Yuck! I know, we were eventually supposed to flip the kitchen and dining room so you would come into the kitchen instead, but time flies, kids grow up and life goes on and we still haven’t gotten to it. Originally the old garage was not attached. Now, I am in the process of a grand revamping of our home and I’m thinking that I don’t really need a separate dining room, but would like a place to put a nice oak table and hutch and then the entry from the garage would not look so out of place. 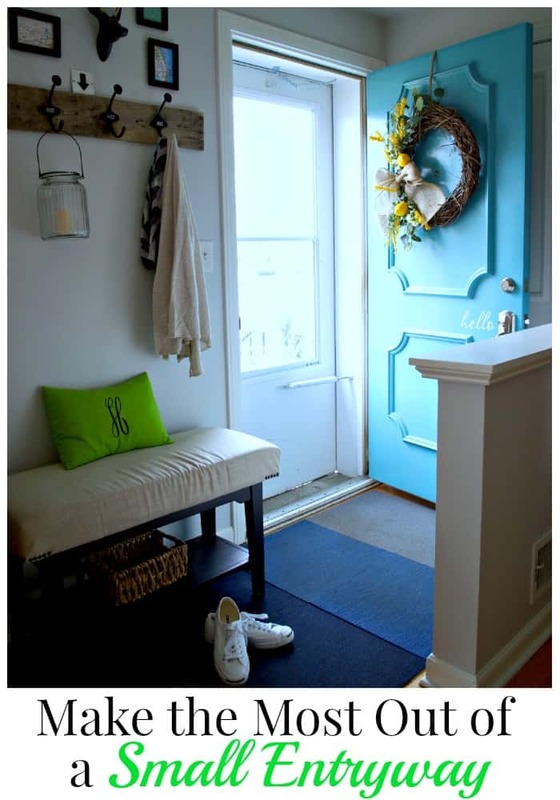 Light bulb goes on when I see your blog and what you did with your entryway. I love the FLOR carpet squares! I have hardwood floors and these squares would cover the floor without damaging the wood. I love the idea that they come in different colors and that they are so easy to care for. The rug we have now, although great to protect the wood (it has a rubber backing) is not very attractive and I think I need to cover more space. One problem is that I have a Frenchwood Sliding Door on the back wall so I lose some wall space for taking off shoes. I think I can work around that with moving the bachelor’s dresser somewhere else in the house and putting a nice bench with a shelf underneath and just making a few other changes. Your display and ideas gave me the much needed ideas I wanted to turn this awkward space into a welcoming home! Thank you Kristi! Looking forward to more awesome ideas! Thanks so much for the nice comment MaryJean! We move into our homes and make plans to do things with great intentions, don’t we? It’s great that you are getting to revamp your house now. I’m glad you liked the carpet squares. I didn’t hold much hope out for them when I first got them, but they have really held up with this terrible winter we have had. They get wet every day but still look good. It sounds like you are putting together some great ideas to make your space more functional. I think moving your bachelor’s dresser somewhere else is a good idea. I have a chest that I’ve used in my entryways in other houses and I just moved it down the wall to make room for the bench, which we really needed to have. I emptied a drawer in the chest so that my husband could dump his stuff from his pockets when he comes home from work. Me and my neat streak. 😉 Good luck with your space. I would love to see some pics when you get done! Just ordered some samples from FLOR. Can’t wait to see them! Will definitely take pics when it’s all done! P.S. I can be a bit of a neat freak too! LOL My husband calls me a “fuss-budget”. LOL My husband just growls at me or gives me the evil eye. That’s great MJ. Can’t wait to see what you do! Oh my gosh! You are so organized. I just opened my messy closet and the rod finally gave way and nearly reamed me in the head. I need to take your tips and put them into action. I do not know why it never occurred to me to put a command hook on furniture, but it is a brilliant idea. I love your blue door. And the trim. And the cool coat rack! LOL…thanks Jenni. My husband would not call me organized but obsessive. I think my use of command hooks just might be obsessive though. I have them almost every where, and they aren’t cheap either. It’s so great of you to visit and leave such a nice comment. Thanks.